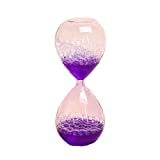 When the grains of sand fall in an hourglass, it usually takes about an hour, but with this cool new Awaglass from designer Norihiko Terayama, the perception of time is lost in a good way as you stare at the hypnotic soapy bubbles rising up instead of down in a matter of seconds, minutes, or whenever it finishes. 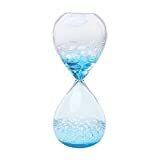 Filled with specially formulated soapy water inside a hand-blown glass hourglass shape, this mesmerizing bubble watch is designed to waste time, not count it down, which makes it perfect on the desk at any boring office job. Check out this video to see it in action.